Whatever else the Postal Service is, it is first and foremost a delivery channel. Its operations are built around materials handling, distribution and logistics. Within that framework, it has been very innovative and successful. With so much attention focused on governance – the business model, regulation and legislation – one of the operational wonders of the world is deteriorating for lack of resources even as new technologies are offering exciting new opportunities for postal operations. A generation ago, postal operations were largely manual and the workforce was heading towards a million. The Postal Service developed a very successful automation program and implemented strategies that steadily improved productivity, along with service performance and customer satisfaction. Postal prices in the U.S. are among the lowest in the developed world. The Postal Service is the world’s most efficient postal system, as measured by pieces per employee. This is despite the size of the network and the number of deliveries to relatively unpopulated areas. For a long time, the world has come here to investigate the most modern equipment and processes in mail handling, distribution and delivery. The Postal Service innovated in scanning technology and a number of other operating processes. Big, high-tech companies had large postal equipment and technology development programs. Even the vehicles – the celebrated “Long Life Vehicles” that made up the world’s largest delivery fleet – were marvels of the time. The Postal Service continues to operate one of the world’s largest alternative fuel capable fleet. The Postal Service has been on the cutting edge of environmentally friendly operations. It has worked with its Strategic Supplier’s Council and with its Mailer’s Technical Advisory Committee to develop new operating ideas and correct operating problems. One of the unsung but most significant innovations has been the Postal Service’s Address Management Program, which created a simple coding system for labeling physical addresses and keeps the addresses current. The Postal Service made this available to all. This includes private sector firms who have created an array of products and services around postal data. It includes competitors who did not have to invest and manage proprietary address systems. It even includes a wide number of beneficial services not related at all to the delivery of mail. The Postal Service has been the world leader in opening its operating system to mailers and their agents, the mail service providers. Through work sharing discounts and outsourcing a number of functions, the Postal Service has restrained the growth of costs. The “Big Iron” exhibits at National Postal Forum and other venues are shrinking. At least one major supplier appears to be trying to unload its postal operations. One industry observer has stated that he “has never seen an industry where so much of the equipment was fully depreciated during the Reagan administration.” The Long Life Vehicles have gone way beyond their expected time, and are being held together with duct tape and baling wire – at considerable expense, but there is no capital to replace them. There is little room to investigate developments in robotics, artificial intelligence in the work floor, and other developments in operations technology. The Postal Service may not even be able to leverage social media in the workplace (the connected workplace). The Postal Service is succeeding in becoming an information powerhouse. “Intelligent Mail” and the concept of total visibility and seamless acceptance is leading to more and better information, enabling postal managers and customers improve service quality and reduce costs. The Postal Service is creating a paperless portal (a digital front end) and an enhanced interface with consumers (digital back end). As the Postal Service and industry move to use powerful new analytic tools to leverage the data, new opportunities are arising for creative solutions and new services. This leads to a next stage of development. The development of advanced sensors, scanning technology and cloud storage is being applied to mail, connecting containers, vehicles and almost everything else in the operating process. It can include everything from vehicle and equipment diagnostics, flexible route design and vehicle location, mail piece tracking from creation to opening, response and fulfillment, and a host of new applications and services. A further refinement is an emerging concept that compares the current fragmented and proprietary protocols within the mailing and shipping industry with the standardized and open platforms of the Internet. There may be significant opportunities for cost reduction and service improvement in materials handling, logistics and distribution by adapting the open platform design of the Internet. Global mail, especially packages, is a growing market. Yet the infrastructure and processes for cross-border package shipments is becoming increasingly inadequate. Every nation has a different, proprietary addressing system. Custom clearing processes, tax collection and payments can be complicated. It is often very hard to track packages across borders. Returning packages is difficult. 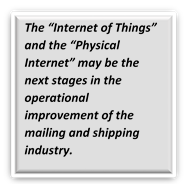 Developing and implementing solutions will be an opportunity for the mailing and shipping industry. The Postal Service and the mailing and shipping industry may be on the verge of another technological transformation in operations comparable to the original move from manual to automated letter mail processing. Yet investment in the necessary research and development has been limited, and there is very little discussion within the industry on this topic. However, this is the real future of the industry.